Marking the 64th annual list, Fortune Magazine put out its 2018 list of the 1,000 top revenue earning companies for the United States. This list is known as the Fortune 1000 list (and Fortune 500 list for the top 500 companies). For 2018, Walmart continues its dominance of the number one spot which the company has held since 2002 with the exception of 2006 and 2009. This year, Exxon Mobile moved into the second highest US based company for revenues, up from fourth place in 2016. This year HCP, Inc of Irvine, California occupies the 1,000th rank on the list. (see: Fortune 1000 list for 2018). Each year, the geography of how Fortune 1000 companies is explored (for past years see 2017, 2016, 2015, 2014, and 2013). Which states have the highest number of Fortune 1000 companies? Where are there clusters of Fortune 1000 companies? Which cities are home to large numbers of Fortune 1000 companies? Find the answers to these questions below. 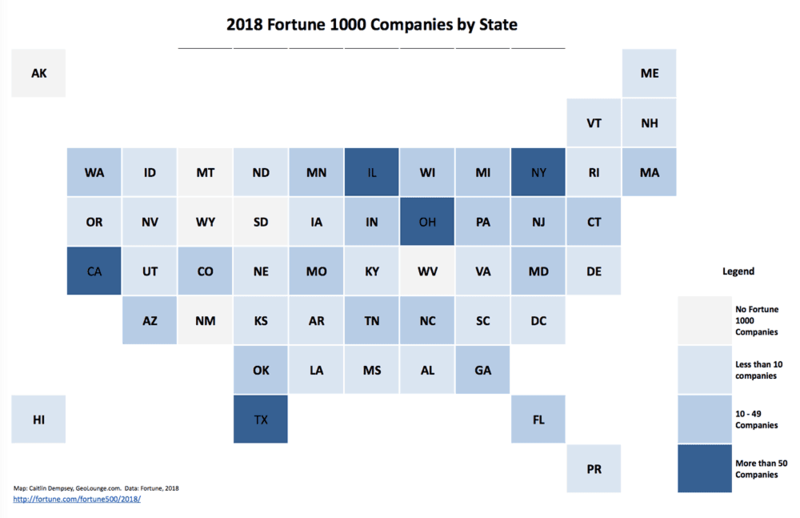 Which States Have the Most Fortune 1000 Companies in 2018? 44 states along with Washington D.C. and Puerto Rico have at least one Fortune 1000 company headquarter. California continues to be home to more than 10% of all Fortune 1000 companies with 118 (up from 114 in 2017). Texas has regained the number 2 spot with 94 companies. New York moved back into second place this year with 93 companies. 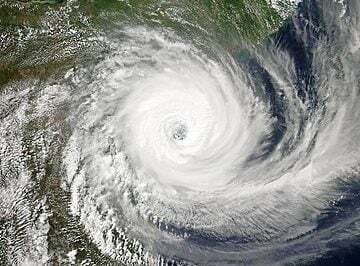 Which States Have no Fortune 1000 Companies in 2018? This year six states continue to have no Fortune 1000 companies: Alaska, South Dakota, Wyoming, West Virginia, Montana, and New Mexico. Maine, which was on the list of states with no companies in 2016, now is home to one Fortune 1000 company: IDEXX Laboratories, Inc. headquartered in Westbrook. Which Cities Have the Most Fortune 1000 Companies in 2018? New York City continues to have the highest number of Fortune 1000 companies with 74 headquartered there. Houston is ranked second with 38 (an increase of three from 2017), followed by Chicago with 27 (up two from 2017). Atlanta comes in fourth with 21 (same as 2017). Dallas rounds out the top five with 16 companies (down one from 2017). While California is a powerhouse with the overall highest number of companies, San Francisco only makes its debut at the number six spot which is shares with Columbus with 14 companies each (both are up one from 2017). St. Louis and San Jose share the eighth spot with 12 companies each. Cleveland takes the tenth ranked spot with 11 companies. You can explore the location of Fortune 1000 companies in detail by exploring the interactive map for 2018 Fortune 1000 companies.